appearances. The 36-year-old Mithali Raj is playing the game at the international circuit for almost twenty years and she is also the fourth-highest among the cricketers as a whole, as Mithali is just behind Sachin Tendulkar (463), Sanath Jayasuriya (445) and Javed Miandad (233). Mithali Raj made her ODI debut back on 25 June 1999 against Ireland in Milton Keynes. Mithali Raj is the leading run scorer in the ODIs among women with 6622 runs. Of the 213 matches India has played since her debut, she has played in all of them barring 13. 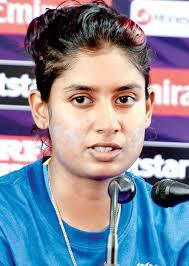 Mithali Raj also holds the record for leading a country in ODIs most number of times with 123 matches.